A great companion Book to the ABCs of Yoga for Kids Book and the Poster. Written by Teresa Power and illustrated by Kathleen Rietz. an illustration with a related name of a pose, i.e: S s - Image of a Shark and a child doing Shark Pose, a word Shark below the illustration. On the back of the card there is a short rhyme/instruction related to the pose featured on the front of the card. Great for developing your little ones' memory skills, eye-hand coordination and focus, as well as yoga related, healthy lifestyle. my legs straight behind me. as I ride a wave’s crest. 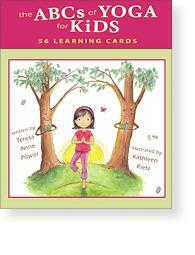 The Learning Cards is a great companion to the ABCs of Yoga for Kids Book by Teresa Anne Power. "This charming book lovingly connects our next generation of yogis to their bodies and their world. Establishing this connection early in our children's lives gives me hope for our planet"
Author of the Seven Spiritual Laws of Yoga and Free to Love, Free to Heal.